President Donald Trump’s decision to withdraw from the Paris climate agreement follows the path of previous presidents who have undermined international climate agreements. We disagree with Trump but it is important to understand his actions in the context of the history of the United States regarding previous climate agreements. Once again, the political problems in the US are bigger than Trump. His action brings greater clarity to the inability of the US government to confront the climate crisis and clarifies the tasks of people seeking smart climate policy. The US has consistently blocked effective climate agreements because both parties in power have put the profits of big energy before the climate crisis when it comes to domestic and international policies. The Republicans proclaimed themselves the “drill baby drill” party while the Democrats are the “all of the above energy” party. Both slogans mean the parties seek to ensure US corporations profit from carbon energy. Both have supported massive oil and gas infrastructure and extreme energy excavation including the most dangerous forms, i.e. tar sands and fracking. Both parties have also supported wars for oil and gas. All of these positions will be viewed as extreme as the world confronts the great dangers of the climate crisis and the US will be deservedly blamed. Gore commandeered the Kyoto conference. The U.S. government, he said, would not sign the Accord – as limited as it was – if it imposed emissions reductions on industrial countries. Instead, he demanded that the rest of the world adopt his proposal that would allow industrial nations like the U.S. to continue polluting by establishing an international trade in carbon pollution credits. Gore’s “solution” – like Obama’s – was to turn pollution into a commodity and buy and sell it in the form of “pollution rights”. The free market trade in “pollution credits” would simply shift around pollution and spread it out more evenly without reducing the total amount of ozone-depleting greenhouse gases. 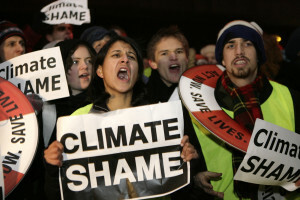 It would allow the United States and other industrial countries to continue polluting the rest of the world. The Kyoto Protocol failed. Rather than reducing climate gas emissions by the 5 percent target, there was a significant increase of 58 percent from 1990 to 2012. Looking at the evidence as a whole there can be little doubt that the Copenhagen climate talks were deliberately and highly effectively scuppered by a ‘dirty tricks’ operation carried out by the NSA and other US security agencies – including the pivotal leak to The Guardian of the Danish text. to present the USA and its President Barack Obama as trying against the odds to secure a climate agreement, in the face of obdurate resistance by other countries. The operation was, in other words, spectacularly successful. The rest of the world were played for suckers. China emerged with a bloody nose. And the US was free to carry on letting rip with its emissions. Making this more confusing for people in the United States are the false statements of Hillary Clinton in the 2016 campaign where she claimed the she and Obama came to the rescue and saved the world from China. This falsehood is described as an alternative reality by some of those who covered the meetings. 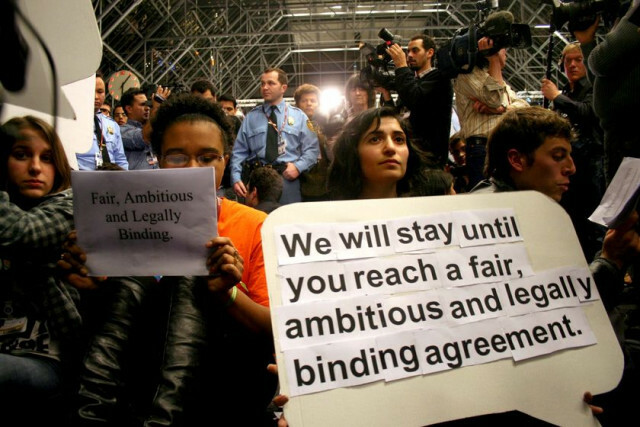 Analysts blamed the United States for the weakness of the agreement, writing COP 21 crafted “the deal according to US specifications in order to insulate Obama and the agreement from attacks.” Obama insisted that the 31-page agreement exclude emissions reductions targets and finance requirements from the legally binding parts of the deal because making those binding would have required US Senate approval, which he could not achieve due to the power of the oil, gas and coal lobbies influence, especially over the Republican Party. Also excluded from legal enforcement was a clause in the agreement that would expose the US to liability and compensation claims for causing climate change. While we are critical of the shortcomings of the Paris agreement we also recognize it is a step to finally — after 21 years of trying — get an international agreement approved by all but two countries (Syria and Nicaragua). Dahr Jamail correctly summarizes the situation when he describes the Paris Accord as not going far enough but Trump’s withdrawal from the agreement endangering life on Earth. He points to the reaction of the world in response to Trump, with uniform opposition to his decision. The new French president Emmanuel Macron urged US scientists, engineers, entrepreneurs to come to France and help “make the world great again” by working to confront the climate crisis. Environmental groups focused on climate change were uniformly critical with some describing the action as making the US a rogue nation. Trump was already unpopular around the world, protested wherever he went, but now he has become a pariah. 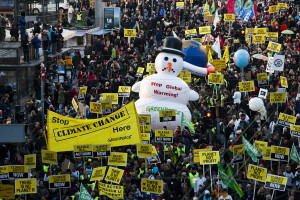 There was an immediate reaction to Trump’s decision with protests at the White House and around the world, with mayors and governors saying they will abide by the climate pact and with business leaders leaving Trump’s business advisory board in protest. The climate justice movement, already growing, will build on this decision by growing even more. The long history of US climate inaction from both parties demonstrates we must build independent political power that undermines those who profit from the status quo and makes both parties face the reality of climate change. Persistence is a key. The day before Trump’s announcement ExxonMobil shareholders and investors voted to require the company to report annually on climate related risks to the corporation. This took decades of work by shareholders inside ExxonMobil. Similar shareholder resolutions are being passed by shareholders of other companies and other votes are very close to passage at energy utilities. 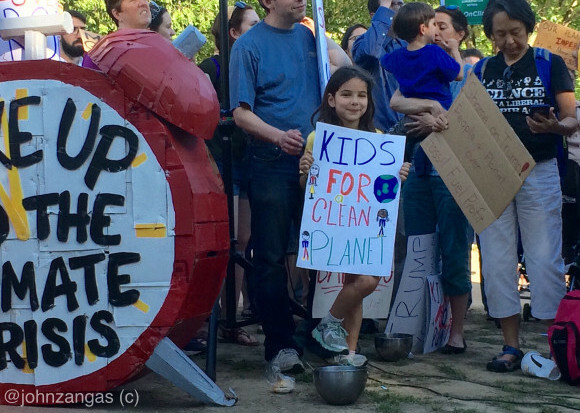 The oil and gas industry must be held responsible for their role in the climate crisis. Litigation against ExxonMobil for hiding the truth about climate change for four decades is advancing in what will be the crime of the century with great liability. There is tremendous momentum around transitioning to a clean energy economy. Jobs in clean energy in the US are at 800,000 and growing and around the world at 10 million workers. In the last three years there has been an 83 percent increase in solar jobs and 100 percent increase in wind jobs. Solar employs more people in the US than oil, gas and coal combined. This January all new energy came from solar and wind without any increase in oil, gas, nuclear and coal. Renewables now account for 18 percent of total installed operating capacity in the US. Renewables accounted for 64 percent of all new electrical generating capacity installed last year in the US. Researchers report that gas powered cars will disappear in the next decade and the oil industry will collapse. Investor advisers are telling people to expect the demise of the industry. The US is just scratching the surface potential of this new economy. 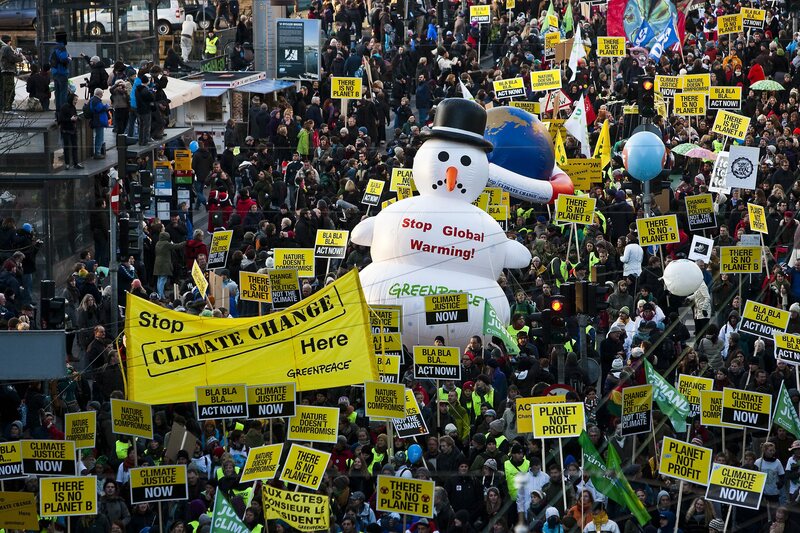 Keep protesting because resistance to the oil, gas and coal agenda continues to be critical. People power has been reported by the industry as the greatest threat to their expansion. Infrastructure protests continue to grow at a time when science tells us to stop developing such infrastructure. Similarly protests are occurring against oil trains turning into a nationwide resistance against the oil trains’ high risks to communities. Another national effort is focused on the Federal Energy Regulatory Commission (FERC), which serves as a rubber stamp for the oil and gas industry. For the past five moths, the FERC has only had two commissioners out of five seats, leaving it without a quorum and unable to approve new fossil fuel projects. Beyond Extreme Energy (BXE) is working to prevent the conformation of new commissioners until FERC stops serving the oil and gas industry and starts serving the health and safety of communities impacted by its projects. 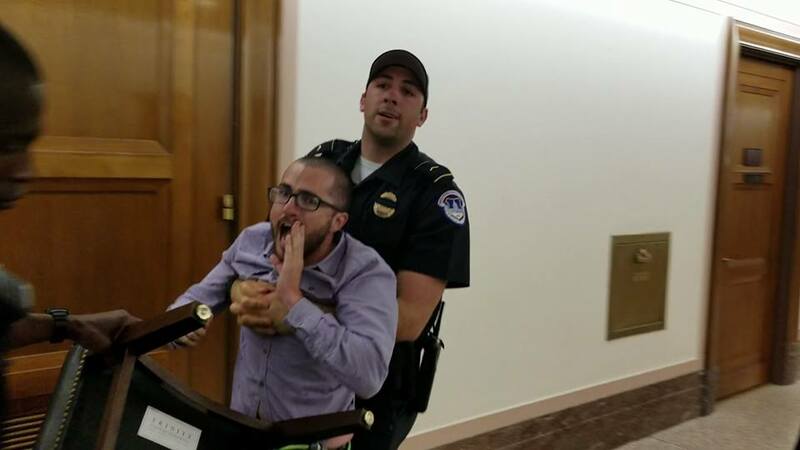 On May 25, BXE disrupted a Senate hearing focused on the FERC commissioners. More actions are planned. Visit BeyondExtremeEnergy.org to get involved. There is something for everyone to do. Another form of extreme energy is nuclear power. 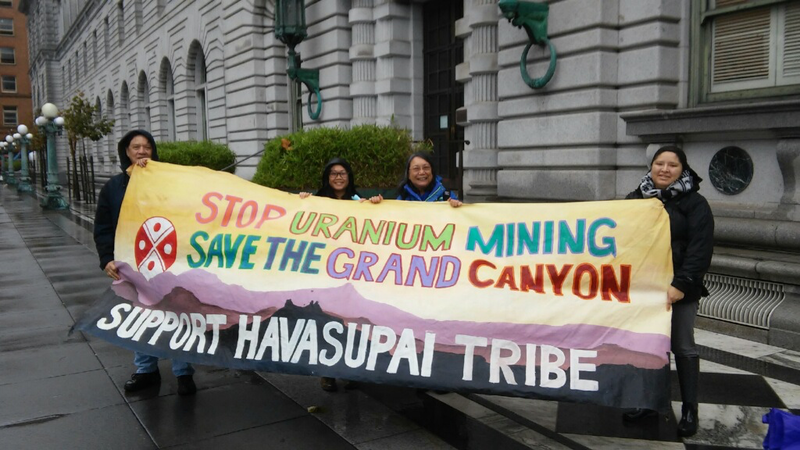 Indigenous communities in the Southwest are mobilizing to stop uranium mining on the rim of the Grand Canyon in a sacred site. If the Canyon Mine succeeds, toxic ore will be trucked 300 miles through tribal lands to a mill close to the Ute Mountain Utes. This month, a Haul No! Tour is being held to raise awareness and hold actions. There is a long legacy of poisoning the air, land and water from abandoned uranium mines throughout the US. On a related note, Ban the Bomb actions are planned on June 17 in support of a new treaty to prohibit nuclear weapons. On the electoral front, Trump’s move ensures climate will be a centerpiece of the 2018 and 2020 elections as the US cannot actually withdraw from the Paris agreement until after the 2020 presidential race. We cannot allow the fraudulent debate commission (really a front for the two corporate parties) to not ask a single question about climate change. 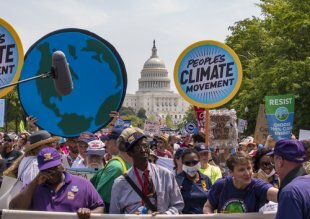 There are massive majorities in favor of staying in the climate agreement – 70 percent of all voters, majorities in both major parties and among independents. In every state this is a majority position. But the reality is the US has a government owned by big energy and Wall Street investors who profit from climate pollution. The current Secretary of State, Rex Tillerson, attended a meeting in Saudi Arabia where ExxonMobil made a multi-billion dollar deal to explore gas off the coast of Mexico and build a refinery in Texas. The US government has been marinated in oil for decades, with presidents and vice presidents who have come from the oil, gas and related industries. Now is the time to change that. 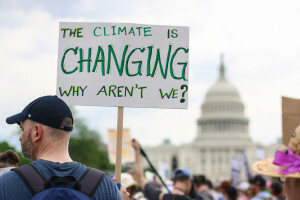 We need to make 2020 an election that produces a president who leads on effective actions to address the climate crisis. 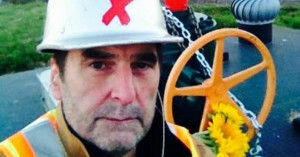 Finally, we agree with Ken Ward, a former deputy director of Greenpeace facing felony charges for shutting down an oil sands pipeline, that Trump’s action is an opportunity. The fig leaf of the inadequate Paris agreement has been removed. The world can advance in creating an agreement not held back by the United States. The movement for a new energy economy must now build enough power to put in place real solutions to the climate crisis. As with many other issues, Trump’s actions crystallize the reality we have been facing for many presidential administrations so the movement now knows what it must do. Kevin Zeese and Margaret Flowers are co-directors of Popular Resistance.